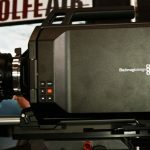 Although we just saw it two short months ago at NAB 2014, it was great to see Blackmagic Design’s URSA again at Cinegear 2014. 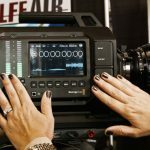 Blackmagic’s Tina Eckman demonstrated the URSA and all its capabilities, of which there are many. The URSA was designed to be a an all-in-one solution for shooting and on this front it delivers. 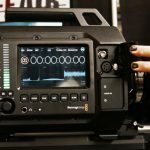 Typically, when one purchases a camera, the second thing they jump into is support gear such as external audio recorders, monitors and the like. 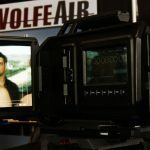 With the URSA, you can bet you’ll have everything you need to start shooting immediately without having to spend more on gear than you do on the camera. Features include three (that’s right, three) built in screens, each with waveforms, focus peaking, and other monitoring assists found in many other monitors on the market today. Eckman points out that these three screens are perfect for having multiple people on camera during a large shoot. So focus pullers, camera assistants etc. can all functionally use the camera at the same time. The URSA also has an internal liquid cooling system, as shooting in higher frame rates causes the camera to become hotter. As Eckman mentions above, the URSA had been running for hours by the time of our interview, and the camera was cool to the touch.